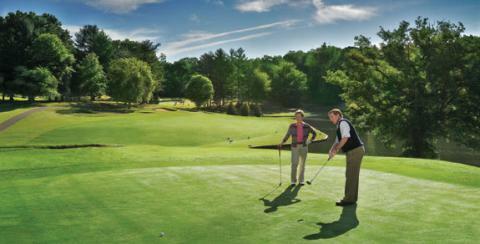 Tanglewood Golf Club, located near Clemmons, NC, has 2 sister courses on premise. The most famous of the two, The Championship Course, has a storied past, including the hosting of the 1974 PGA Championship won by Lee Trevino. In 1974, Lee Trevino edged Jack Nicklaus by one-shot to win the 56th PGA Championship. Sam Sneed who was 62 years old at the time finished tied for third. The USGA Amateur Public Links Championship was played in 1986 and won by current tour player Billy Mayfair. From 1987 to 2002 it was the home of the Senior PGA Tour’s Vantage Championship which was won by such notable names as Lee Trevino, Gary Player, Hale Irwin and Larry Nelson. Jim Colbert won a record three times. In 2002 Bruce Fleisher shot a 60 in the second round. Designed by the legendary Robert Trent Jones, Sr., the course has 5 sets of tees, ranging from about 5400 yards from the shortest tees to about 7100 from the longest tees. Bunkers are plentiful on the Championship Course. Counts have ranged from 90 to 140, so suffice it to say, there are a lot. And the type of sand is interesting to say the least. It's unlike sand you'd play on most courses, being more of a red clay type sand, and not the fluffy white stuff we normally play. Greens are usually in really good shape, quick, with complex undulations. It's best to make sure you know where the pin location is as you may need to take an extra club. This is not a simple 'bomb it' off the tee course and try to go find it. Doglegs and fairway slopes can lead you into trouble if you're not careful. If you want to score well, it's best to have a plan before you swing. Know where you want to go and more importantly, where you want to avoid! It's a great course, very challenging, so make sure you choose the correct tee box. Judging the difficulty of the course by the length along would be a mistake. Between the bunkers, the rough, the green complexes and the course layout, it's recommended to play up and have an enjoyable round. Facilities-wise, Tanglewood has driving ranges, putting and chipping greens and a full service clubhouse, grill and pro shop. Costs are reasonable for a more upscale golf course. Rates are <$40 most days.